Directions Do not take more than directed. Adults take 1 to 2 tablets every 4 hours, as needed, with water. Do not exceed 12 tablets in 24 hours. Children under 12: ask a doctor. Store at room temperature. Avoid excess heat and humidity. Warnings Reye's syndrome: Children and teenagers should not use this drug for chicken pox or flu symptoms before a doctor is asked about Reye's Syndrome, a rare but serious illness reported to be associated with aspirin. Allergy alert: Aspirin may cause a severe allergic reaction which may include: hives, facial swelling, shock, asthma (wheezing). Alcohol warning: If you consume 3 or more alcoholic drinks every day, ask your doctor whether you should take aspirin or other pain relievers/fever reducers. 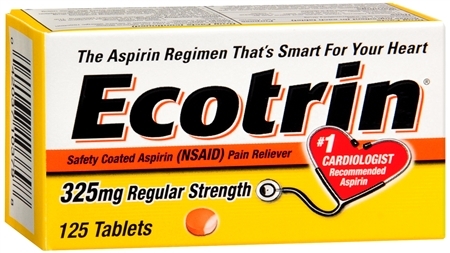 Aspirin may cause stomach bleeding. Do not use if you have ever had an allergic reaction to any other pain reliever/fever reducer. Ask a doctor before use if you have: ever had an allergic reaction to aspirin; ulcers; bleeding problems; stomach problems that last or come back, such as heartburn, upset stomach or pain; asthma. Ask a doctor or pharmacist before use if you are taking a prescription drug for: diabetes, gout, arthritis, anticoagulation (blood thinning). When using this product do not take more than directed. Stop use and ask a doctor if: pain gets worse or lasts more than 10 days; ringing in the ears or loss of hearing occurs; new symptoms occur; allergic reaction occurs. Seek medical help right away; redness or swelling is present. If pregnant or breast-feeding, ask a health professional before use. It is especially important not to use aspirin during the last 3 months of pregnancy unless definitely directed to do so by a doctor because it may cause problems in the unborn child or complications during delivery. Keep out of reach of children. In case of overdose, get medical help or contact a Poison Control Center right away.